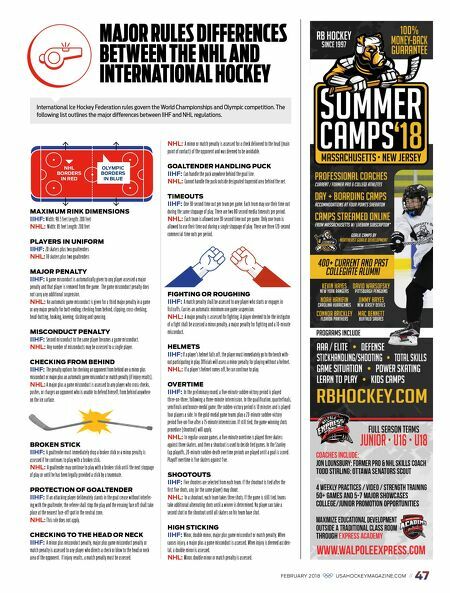 PHOTO BY USA Hockey Magazine Archives W hile all eyes will be on the U.S Men's and Women's Teams as t h e y l o o k t o b r i n g h o m e t h e gold medal at the 2018 Olympic Winter Games, they won't be the only ones representing USA Hockey. S e ve n m e m b e r s o f t h e o r g a n i z a t i o n 's Officiating Education Program, four women and three men, have earned the opportuni- ty of a lifetime after being selected to rep- resent the country 's officiating corps in PyeongChang, South Korea. "USA Hockey is very proud of the officials selected to work the 2018 Olympic Winter Games," said Matt Leaf, the program's direc- tor. "These officials are well-positioned to represent USA Hockey at the highest level, each having been committed and dedicated to successful officiating for many years." Like the rest of her compatriots who drew their first Olympic officiating assignments, Melissa Szkola acknowledged the mixed emo- tions that came with receiving this honor. "It's difficult," said Szkola, who received the call while at work in St. Clair Shores, Mich. "When you've worked together as part- ners, as colleagues and as friends for years, to know that a dream is coming true for a cou- ple and the dream may have to be extended another four years for others is hard." Along with Szkola, heading to South Korea on the women's side are fellow referee Dina Allen, and linesmen Katie Guay and Jessica LeClerc. Timothy Mayer, who has refereed in the American Hockey League for several years, will be joined on the men's side by linesmen Fraser McIntyre and Judson Ritter. Like Szkola, Mayer called the news "a blessing " at the end of a long and thorough selection process. "It's been a long jour- ney and this is obviously a goal that I've had for quite some time and to finally be able to achieve it and make something l i k e t h i s h a p p e n , I 'm very thankful," said the Okemos, Mich., native. "Every year it seems like I g et to do something t h a t 's a t r u e o n c e - i n - a-lifetime experience. Now it culminates with this." M a y e r p r a i s e d t h e e x p e r i e n c e h e h a s gained from officiating in various interna- tional competitions, including the 2016 IIHF World Championship alongside McIntyre and Ritter. He also recognized those who have helped him get to where he is today. "It's all the people that helped me get to this point that I'm so thankful for," he said. "I didn't do this on my own, I'm very aware of that. I'm just truly blessed I've had great supervisors and great support through friends and family." Mayer also echoed his sentiments towards those who weren't chosen, a feeling of disap- pointment that he has felt in the past. "I was really happy for the other two guys that got selected, but there's that sense of feeling that you want e ve r y o n e t o e x p e r i - ence something like this, and unfortunately that can't be the case," he said. "You really feel for the guys that didn't get the opportunity." As the group pre- p a r e s t o r e p r e s e n t U S A H o c k e y o n a n international stag e, the reality of the moment has not yet sunk in and may not until they clear customs in South Korea. " I t 's a n a m a z i n g e x p e r i e n c e t h a t n ot many are lucky enough to be able to have," Szkola said. "I feel very blessed to have that opportunity." 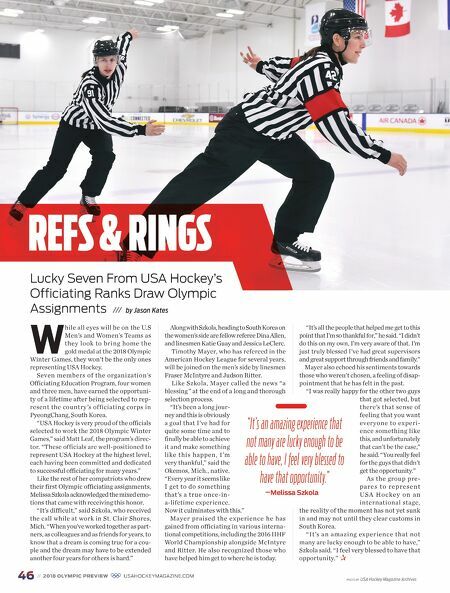 P –Melissa Szkola 46 // 2018 OLYMPIC PREVIEW USAHOCKEYMAGAZINE.COM REFS & RINGS Lucky Seven From USA Hockey's Officiating Ranks Draw Olympic Assignments /// by Jason Kates "It's an amazing experience that not many are lucky enough to be able to have, I feel very blessed to have that opportunity."